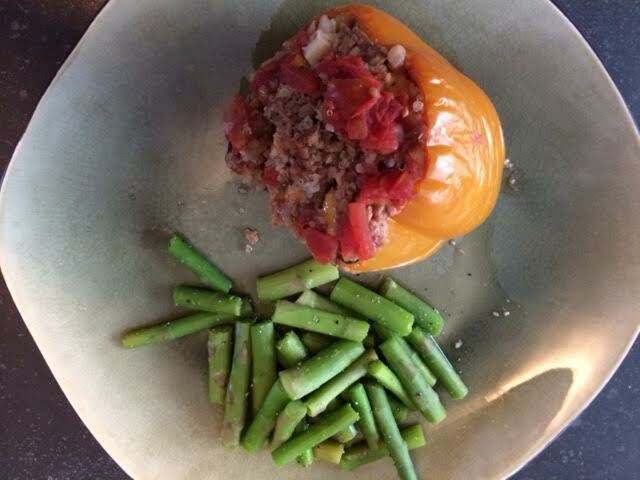 Vegetarian Stuffed Peppers | Om nom nom! Cut the tops off the peppers and remove the seeds and ribs. In a large mixing bowl, combine crumbles, rice/quinoa, about half the can of tomatoes, onion, garlic, cheese, egg, salt and pepper. Mix well, then stuff peppers with the mixture and place in crock pot (stuffed side up). Poor stock and tomatoes over the peppers, and cook on high for 5-6 hours or low for 8-9 hours.